When daughter-in-law Esther translated my English given name to “Susi” – pronounced with double sibilance, like Dr. Seuss, except with a “y” sound at the end – I was charmed by the sound of it whistling off the tip of her tongue. Here in Mexico, it is how I am introduced, and how I introduce myself to others. If only I could slough off this angst and recapture the child-like openness the Spanish version of my name suggests. I have fallen into a new morning schedule here, with the indoor walking DVD and a few household and personal care routines evolving as necessary. Jason and Esther have moved into the second upstairs bedroom, since her long-vacated, inherited house is in need of repair. I do my bustling before others are about, and then settle into vacation mode with a book or glass of iced lemon water on the patio. This morning, we set out to walk to Esther’s favorite juice bar and land there about 11:30, not yet having eaten and craving a good brunch. But this is a busy place, literally humming with activity and chatter. The menus, of course, are in Spanish. The wait staff, logically, speaks their native tongue, not mine. I am so hungry I can’t think straight, and the complicated business of having Esther translate my every question and the waiter’s every response makes me dizzy with confusion. Jason speaks Spanish, as does Jack. They are also less neurotic about what they put into their stomachs, and easily find a menu item that appeals. This is a sandwich shop which specializes in custom-blended drinks of whatever combination the diner selects. More decisions, more anxiety, more need for translation. I finally blurt out a selection, because everyone else is waiting, then realize I have misspoken. More embarrassment and stomach-clenching tension, as Esther scrambles to cancel my order, and I surrender to the role of famished martyrdom rather than trying to join the group in their enjoyment of a meal. What a fool I feel. It is the language thing. It is the being off-schedule and not having eaten breakfast thing. It is my torment over being the only one in the party who cannot envision myself living happily in remote San Miguel, with its low taxes, laid-back lifestyle, and virtually perfect climate. It is the cacophonous level of noise surrounding us. All these things come together like a tornado in my gut. I could sob out loud if I weren’t so self-conscious about making even more of a scene than I already have. Down the stairs. Step outside. Gulp in a few breaths of fresh air, as cars rattle by on the busy thoroughfare outside the restaurant. Dear God, what is wrong with me? Am I four years old, for Pete’s sake? Do other adults have this breath-robbing reaction to alien environments, like a flopping fish having been yanked from familiar waters? I need to eat, and I need not to cause stress for my fellow travelers. Get a grip. Back inside, I finally sort out my swirling thoughts and manage to convey, through Esther, a new, well-thought-out order to our saintly waiter, who patiently jots down my wishes as if I were a perfectly sane and reasonable new arrival whom he has just set eyes on for the first time. Within minutes, I am again a part of the chatty group, and my bad behavior has been rewarded with a plate of hot and oozy ham and Swiss quesadilla with avocado and tomato on the side and a blenderful (really; brought right to the table with a tall milkshake glass which it will fill twice) of orange, papaya, strawberry, carrot, and guava fruit, swirled into the most heavenly of smoothies one could imagine. From internal chaos, to blissful ecstasy. The transformative power of panic-driven prayer and a good meal. La Placita: plaza; piazza; public square; marketplace; shopping area. A fifteen-minute cab ride deposits us across the street from this weekly extravaganza of buying and selling. “Placita Grande” says it better. The place is enormous, and shoppers can fill almost every need here, as they mill around in a scene reminiscent of a Marrakesh Market or Istanbul Bazaar. It is 80˚ and windy. Dusty air and the smell of frying fish waft in gusty bursts, taunting the nostrils, as a steady din of rapid-fire Spanish, a megaphone-wielding evangelist, and roving musicians compete for the available sound waves. Amidst it all, cheery vendors serve up plates of oil-puddled pizza slices topped with mounds of French fries, accompanied by the ultra-sweet Mexican version of Coke and soon to be followed by a slab of the milky dessert called Pastel de Tres Leches, or perhaps a pillowy, deep-fried sopapilla. It is no wonder that this population, like my own, is experiencing a diabetes epidemic. As we elbow our way through the dense clusters of humanity, we pass a guitar-playing father and his singing daughter, her eyes, liquid chocolate; her hand timidly offering a Styrofoam cup to receive tokens of appreciation in the form of peso coins, or perhaps even paper, from a “rich” American tourist. More heart-rending is the stooped beggar with one crippled foot splayed out in a brace, his sad, weary stare vacantly searching the distance as he hobbles past mostly unmoved shoppers, eager to get something more tangible than the satisfaction of a generous heart from their next expenditure. Back to our casita to unpack the day’s purchases, then it’s off on foot to explore the sprawling, ancient Parqué Guadiana. All this walking is good, once you learn to watch your step very carefully and to seek out the most civilized routes. Dinner is a taco salad at a restaurant operated by one of the many Canadian transplants in this ten percent expatriate community, and then back to our rental house to unwind in the flower-scented peace of the courtyard and watch the sun drop beyond the wall into a saffron-colored strata of clouds. Around 9:00 p.m. my husband and I are puzzled to hear a plaintive voice crying out in the darkened street. “He is selling grilled corn on the cob,” says Esther. “This is very common here.” The mournful sound becomes enchanting with her explanation, a perfect metaphor for this enigmatic place. Another eight hours of sleep splintered only by the occasional howling of the neighbors dogs. I stealthily slip into my workout clothes and get in a two-mile indoor trek using the “Just Walk DVD With Toning Band” I bought expressly for this purpose. Steamy hot, orange-scented tea on our sunny patio before we head for Centro around 11:00, seeking out a flatter route today. By 11:30 we are wandering around the town square trying to find someplace for a quick, cheap lunch. Centro is okay for quick, not so okay for cheap. Where is daughter-in-law Esther to steer us to one of her favorite hidden haunts? We settle on a pleasant outside table at a clean little cafe where my husband Jack can order ala carte, while I choose a platter of three small quesadillas, oozing with melted oaxaca and well-stuffed with seasoned shredded chicken breast. Add a rice-based side salad with aioli dressing, an iced agua mineral (sparkling water), and I am primed to just sit and soak up the warm midday air. But it’s getting late, and we must be off to a 12:30 meeting with the realtor to look at five homes she’s lined up for our consideration. We arrive at the Realty San Miguel offices at five minutes past the half-hour. Late for us, but not unusual for San Miguel, where “mañana” may literally translate to “tomorrow,” but in actuality means “at some future date.” Our agent steps into the gated courtyard to greet us, six feet of slender, casually stylish, raven-haired gorgeousness that suggests she left a modeling career behind to move here from her home in Washington state a few years ago. She has hired a driver for the afternoon. She doesn’t own a car. Like many locals and transplants, she uses the cheap cab service – $3.00 for anywhere within the city limits – or walks. And like many locals and transplants, she does that walking over these challenging surfaces in espadrilles or strappy sandals or flip flops, or even high heels. I plod along after her in my sensible black Reeboks. At least they match my slightly baggy grandma jeans – bought one size too big for comfort on the flight down. This house hunt takes us to a not-yet remodeled office space that can be tailored to suit our needs, but encases a difficult twisting stairway to the upper level and a limited kitchen footprint; a modern new development – a southwestern-style jewel in the crown of an already renowned New York City architect that screams contemporary/adobe fusion gone amok to my conservative tastes; and a beautifully redecorated place with every desired amenity plus a tasteful blend of sleekly outfitted kitchen, comfortably-sized rooms, a rooftop terrace, and calm-inducing designer color scheme. There’s even a crying-wall fountain visible from the double-glass doors of the upstairs master bedroom. Inside, peaceful perfection. Step out the front door. A vacated, graffiti-marred structure greets you across the street. Next door on one side, the schoolyard of very modest institution formed of grey concrete and glass block, and to the right, a property ragged from years of neglect and harsh sun exposure. 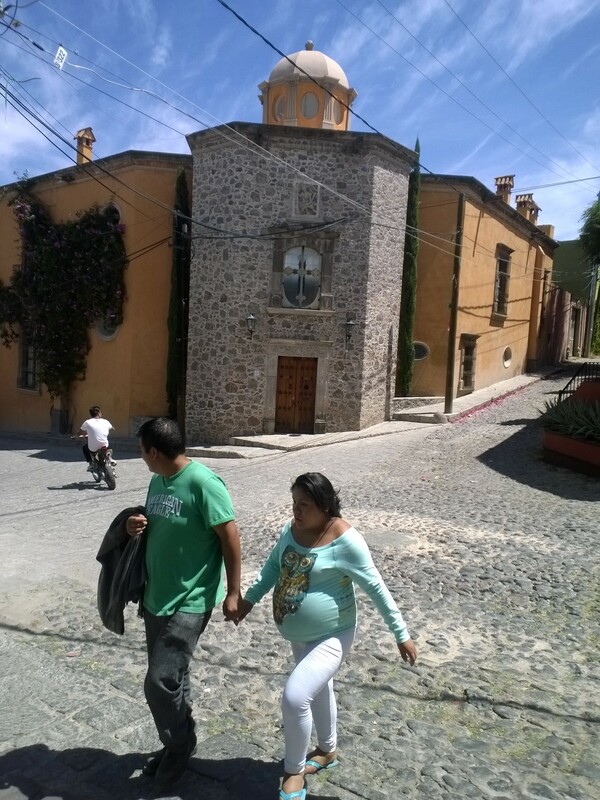 The pedestrian approach here is a difficult one, also: far from Centro, along steep sidewalks and curving streets, all paved with rugged, uneven stones that challenge even my rubber-soled footing. Two more properties – modest, accessible, but uninviting, as viewed through the weary eyes of disbelief that make me feel like Alice in Wonderland, not being able to make sense of the mixed surroundings and humble lifestyle of this new and foreign place. Am I judging? It’s not at all that I feel “too good” for these surroundings. It is simply that being here makes me sad. Isolated and out of my element. A stranger in a strange, crumbling landscape with no lush greenery anywhere to suggest life and seasonal regeneration. And most of all, misled and confused by the internet hype I’ve read and viewed over the past twelve months. “It’s magical,” our real estate agent had said of that first glimpse of San Miguel that compelled her decision to leave family and personal history 3,000 miles behind. Am I hardened against Magical Experiences? My husband seems to sense it, this charm that others feel lured by. I am reduced to tears trying to explain my panicked aversion and my guilt over not falling in love with the place. By 4:00 p.m., under a bedroom ceiling fan that threatens to spin off its wobbly base, I rest, read, and recover in time for another visit to Esther’s brother’s house on the edge of town. Here, Jack and son Jason are regaled in a belated joint birthday celebration. Grilled, marinated skirt steak, fabulous homemade beans, mounds of steamed broccoli and cauliflower, more grilled scallions, heaping bowls of fresh cantaloupe, and papaya so intense with juicy tropical flavor I barely recognize the taste. Next comes a huge birthday sheet cake, with candles, and at least a dozen eager children, belting out the Spanish version of “Happy Birthday” – a rendition with at least twelve verses that goes on and on, lifted to the rafters by joyful young voices, and led by the aging household matriarch with equal enthusiasm. The song finally completed, each young performer marches over to give the birthday boys a handshake, and sometimes a hug. As a finale, two sweet second graders in their plaid school uniform pleated skirts and crisp white blouses, grasping hands and swaying back and forth to keep rhythm, provide an endearing encore almost as long as the main tribute. The tender look of sheer and blessed appreciation on my husband’s face is truly a memorable gift to behold. I don’t understand this way of life, but I so appreciate these dear little ones and their gracious, hospitable parents, so willing to “make a party,” and to share all that they have. My head may be swirling with confusion, but my heart is full to the brim.